Click the button below to add the Audio Microphone for Zmodo DVR Surveillance Systems to your wish list. Our friendly staff is here to help! Why Buy From ZmodoDirect ? Communication: We're real people you can call and talk to! Trust: We're leaders in the Home Surveilance Business. Privacy: We hate Spam, and so won't sell your info. Secure: Your orders are processed on a secure server w/ SSL encryption. One add-on mini audio mic for all cameras that need audio recording. Highly Sensitive microphone and 12V power regulator built-in. Works with any Zmodo DVR with Audio input. ***Note that almost all Zmodo units made beofore 2015 had Audio inputs as a standard option. Models from 2015 and later generally do not come with audio, unless it is a 16CH or larger DVR. 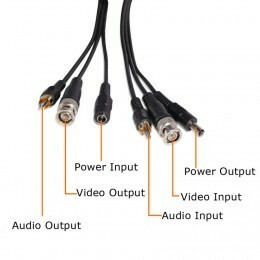 These mics are allso compatible with any DVR that accepts audio input via RCA. No extra power - Doesn't need an extra power adapter. Microphone comes with a built in power splitter. Great addition to surveillance system and a no pain installation. Quick delivery. Just installed two mics on my system. Excellent product. Picks sound very well. Love your products but why cant Zviewer be enabled to allow for sound? Works really good up to 80 feet. You can hear further but it's not as clear. Can't beat it for the price.